I combined this stamp with some digital paper from THIS kit by Betsy Tuma. So many pretty patterns. I just recoloured this polka paper to match my preferred colour scheme. Lots of glossy accents on the butterfly... yum. P.S. Hope you've seen my current challenge, and hope you get a chance to enter. love that glossy butterfly! lovely card, Lucy! 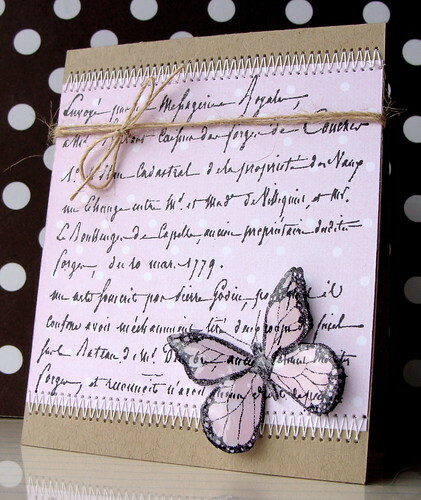 which script stamp did you use over the polka dot paper and butterfly? thanks! So simple and yet so stunning! Love all this pink and the glossy butterfly! I love simple cards that have an impact. That stamp is great! Both you and Betsy rock! :) I never would have thought to do something like this in pink, but it really works! Well you just can't go wrong with a good dollop of Glossy Accents can ya?! LOL! What an elegant card. Love it! Beautiful card Lucy! 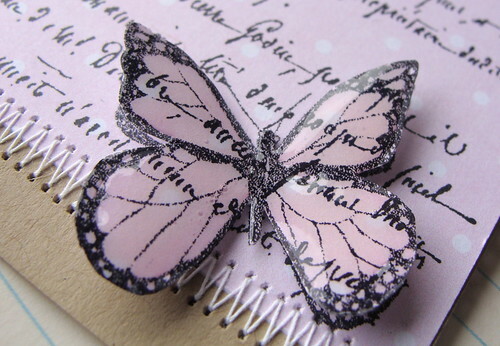 Love the pink butterfly! Really LOVELY! I think I need that stamp now, all this enabling is driving me crazy, so much goodness! Just beautiful. Love the glossy accents and your stitching, as always. Oh gorgeous! Thanks for playing EBTKS! Beautiful card, Lucy! Congrats on being featured!